This year coincides with the fifteenth year of the Discover Cork: Schools’ Heritage Project. Brochures have been sent to all Cork schools. Launched again for the new school term, the Project is open to schools in Cork â€“ at primary level to the pupils of fourth, fifth and sixth class and at post-primary from first to sixth years. There are two sub categories within the post primary section, Junior Certificate and Leaving Certificate. A student may enter as an individual or as part of a group or a part of a class entry. Co-ordinated by myself, one of the key aims of the project is to encourage students to explore, investigate and debate their local heritage (built, archaeological, cultural and natural) in a constructive, active and fun way. Projects on any aspect of Cork’s rich heritage can be submitted to an adjudication panel. Prizes are awarded for best projects and certificates are given to each participant. 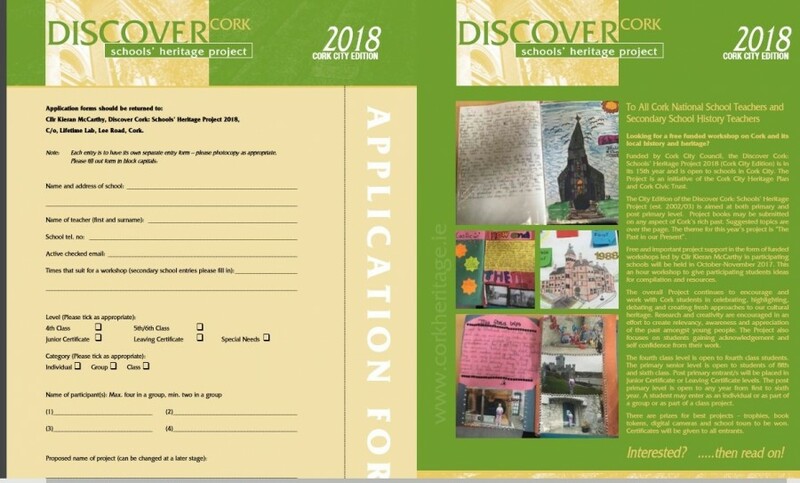 A cross-section of projects submitted from the last school season can be gleamed from this link on my website, www.corkheritage.ie where there are other resources, former titles and winners and entry information as well. Students produce a project on their local area using primary and secondary sources. Each participating student within their class receives a visit and workshop in October 2017. The workshop comprises a guide to how to put a project together. Project material must be gathered in an A4/ A3 size Project book. The project may be as large as the student wishes but minimum 20 pages (text + pictures + sketches).Â Projects must also meet five elements. Projects must be colourful, creative, have personal opinion, imagination and gain publicity before submission. These elements form the basis of a student friendly narrative analysis approach where the student explores their project topic in an interactive and task oriented way. In particular, students are encouraged to attain material through visiting local libraries, engaging with fieldwork, interviews with local people, making models, photographing, cartoon creating, making DVDs of their area. Re-enacting can also be a feature of several projects. For over fifteen years, the project has evolved in how students actually pursue local history. The project attempts to provide the student with a hands-on and interactive activity that is all about learning not only about heritage in your local area (in all its forms) but also about the process of learning by participating students. The project is about thinking about, understanding, appreciating and making relevant in today’s society the role of our heritage our landmarks, our oral histories, our scenery in our modern world for upcoming citizens. So, the project is about splicing together activity on issues of local history and heritage such as thinking, exploring, observing, discovering, researching, uncovering, revealing, interpreting and resolving. This year as well there is a focus on the theme â€“ the Past in our Present. 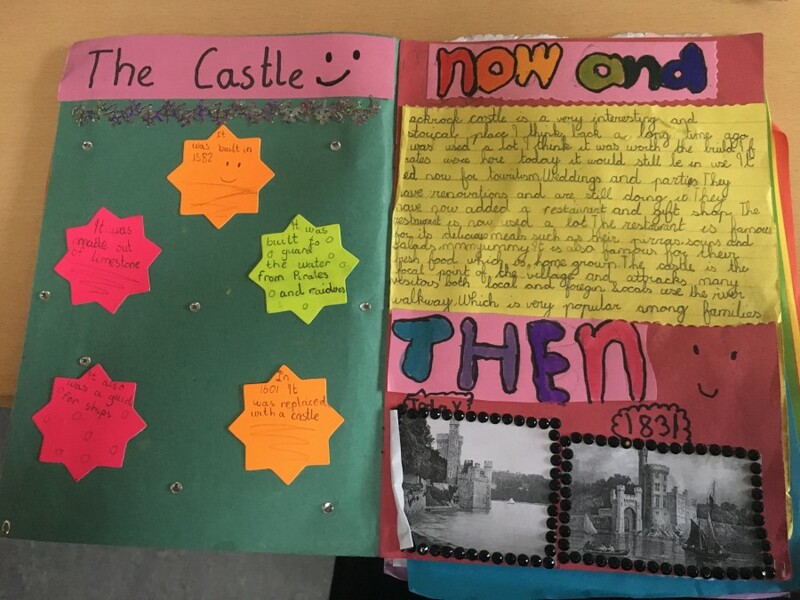 The importance of doing a project in local history is reflected in the educational aims of the history curricula of primary and post-primary schools. Local heritage is a mould, which helps the student to become familiar with their local environment and to learn the value of it in their lives. Learning to appreciate the elements of a locality, can also give students a sense of place in their locality or a sense of identity. Hence the Project can also become a youth forum for students to do research and offer their opinions on important decisions being made on their heritage in their locality and how they affect the lives of people locally. I know a number of students who have been involved in the project in schools over the years who have took their interest further and have gone on to become professional tour guides, and into other related college work. The project is open to many directions of delivery. Students are encouraged to engage with their topic -in order to make sense of it, understand and work with it. Students continue to experiment with the overall design and plan of their work. For example, and in general, students who have entered before might engage with the attaining of primary information through oral histories. The methodologies that the students create provide interesting ways to approach the study of local heritage. Students are asked to choose one of two extra methods (apart from a booklet) to represent their work. The first option is making a model whilst the second option is making a DVD. It is great to see students using modern up todate technology to present their findings. This works in broadening their view of approaching their project. This project in the City is free to enter and is kindly funded by Cork City Council (viz the help of Niamh Twomey, Officer) and. Prizes are also provided by the Cork Civic Trust (viz the help of John X Miller), Lifetime Lab, Lee Road, Learnit Lego Education, and Sean Kelly of Lucky Meadows Equestrian Centre, Watergrasshill (www.seankellyhorse.com). There is also a County Cork edition. Overall, the Schools’ Heritage Project for the last fifteen years has attempted to build a new concerned generation of Cork people, pushing them forward, growing their self-development empowering them to connect to their world and their local heritage. Spread the word please.